The Student Success & Counseling Center is here to assist you with successfully completing your program of study and meeting your transfer and career goals by providing academic advisement, transfer assistance, and career planning! At the SSCC, we’re all about success! We want to help you navigate, prepare, and discover your plan to academic, career, and personal success with our wide range of FREE student resources. Unsure about what to major in or the right classes to take for your major? Don’t worry! Our advisors are here to help you explore everything ESCC has to offer and to help you discover what is right for you from your first semester to graduation! Want to ensure you don’t waste time and money taking classes that won’t transfer? We will help you select specific courses that may be required at the college or university to which you plan to transfer. Begin by visiting the STARS website http://stars.troy.edu/ and researching the courses required for your major by your transfer college. We’d like to help guide you through course selection and the transfer process. Interested in taking a career interest inventory, searching for jobs, creating a resume or preparing for an interview? 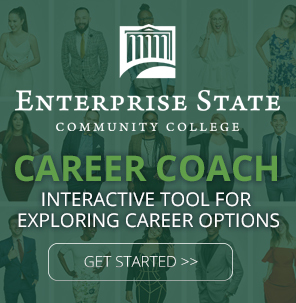 We have an online career interest inventory and career services tool that will help you to navigate career opportunities and plan for the career of your dreams. Come check it out! To complete an online career interest inventory and to discover what majors and careers would be the best fit for you, visit https://www.focus2career.com/Portal/Login.cfm?SID=452 and complete the Focus 2 Career inventory. All you need to do once you are on the website is click the link to register, create your own personal account, and enter the Access Code: success to access the inventory. It’s as easy as 1-2-3! We would be happy to discuss your results with you. Coming soon…Career Services Central! Career Services Central is an interactive tool that links employers with prospective job candidates. It is a powerful tool for students and alumni to maintain a resume and find jobs. Having trouble with a class? Free tutoring is available for you! Our tutors offer sessions on a range of topics in a private one-on-one setting. You can schedule an appointment or drop by and receive the help you need during designated walk-in times. Need some extra skills to help you perform to your maximum potential? We have you covered! Our workshops are designed to be interactive experiences that cover a range of topics focused on improving your success. Topics will cover Choosing a Major, Career Choices, Test Preparation, Mental Wellness, Developing GRIT, and much more!